Manfred Haas at Haas International tells me there’s been a €1 million price reduction on the 34.2m sailing yacht Obssesion II, a joint listing with Eric Trupheme at Ocean Independence. Built by France’s CIM Shipyard to a design by Berret/Racoupeau in 2002, this superyacht is Bureau Veritas classed and her 34 square metre saloon offers panoramic ocean views. Last refitted in 2008, Obsession II accommodates up to eight guests in four sumptuous staterooms: a master, three doubles and a twin plus two cabins for three crew. 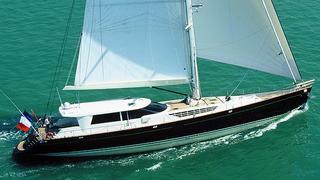 Currently back at the CIM yard for a winter refit, her new asking price is €3.5 million.